Since I often get the complaint from my mother and sister that they don't get to see many photos of me, below is a set of photos that include me that Rusty took over the course of the trip. To get the proper time line and other photos please look at the actual day entries for the 2010 Death Valley Trip journal, see link above. The first day or two in the journal entries I did include a few of Rusty's images, which are not repeated here. 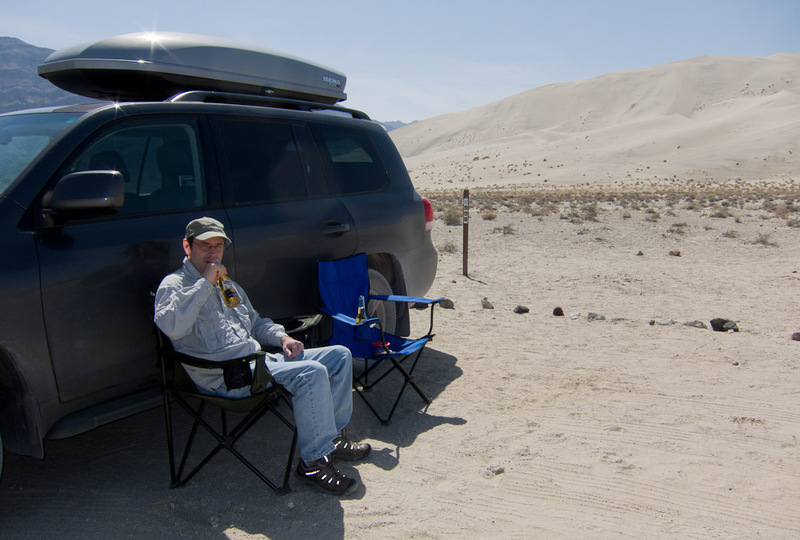 Below is me hiding from the wind behind my car at Eureka Dunes. The sand was blowing so much that after sitting down for just a few minutes we were collecting sand on our cloths that was settling in the lee of the car, see Day 4. Standing out in the wind at Eureka Dunes. 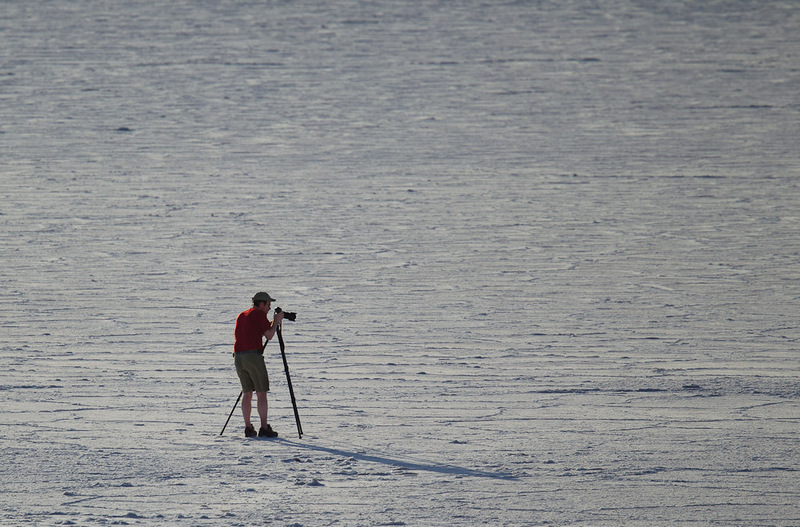 Below is a telephoto shot of me hiking up on the dunes looking for some interesting photos to take. 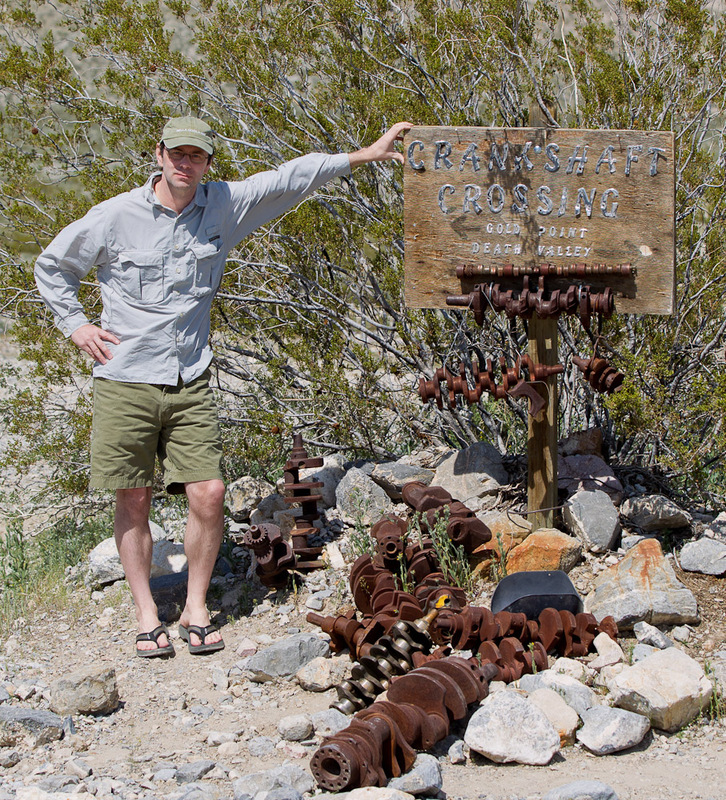 Crankshaft Junction on Death Valley Road, also see Day 4. 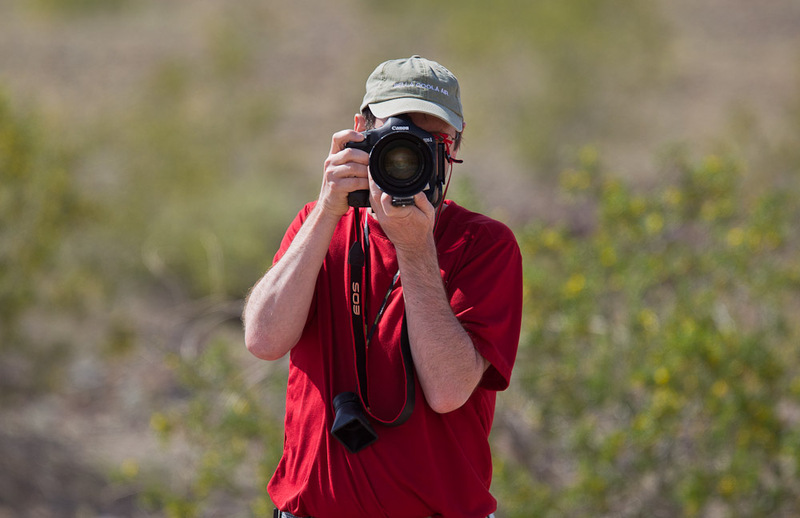 Below is a make believe shot of me in Titus Canyon. The rock ledges are actually at a steep diagonal angle but Rusty rotated them flat in Lightroom. So it's me at a diagonal instead of the rock face. See Day 5, although I did not actually post any of my images of Titus canyon. 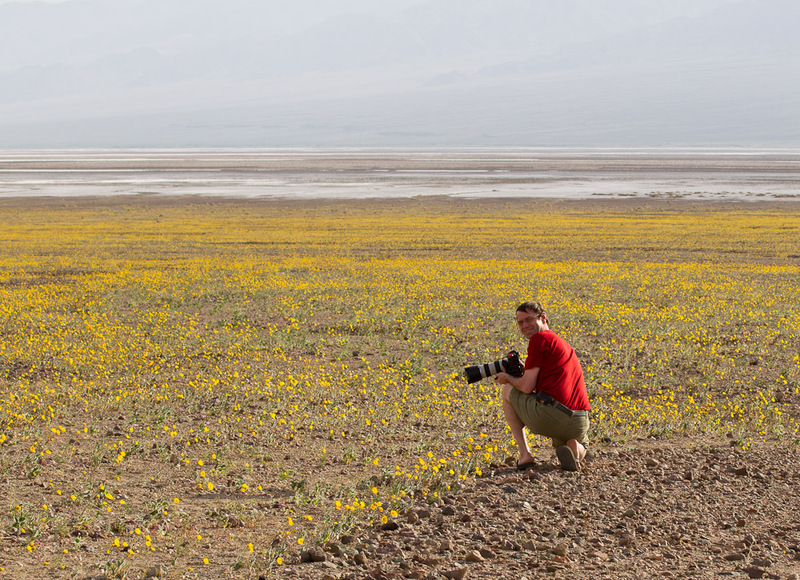 Here I am taking the field of flowers photo, see Day 5. To take this photo I was enduring the most wind we had at any time, somewhere between 40 and 50 mph. I could hardly open the car door and I did not even bother with my hat. 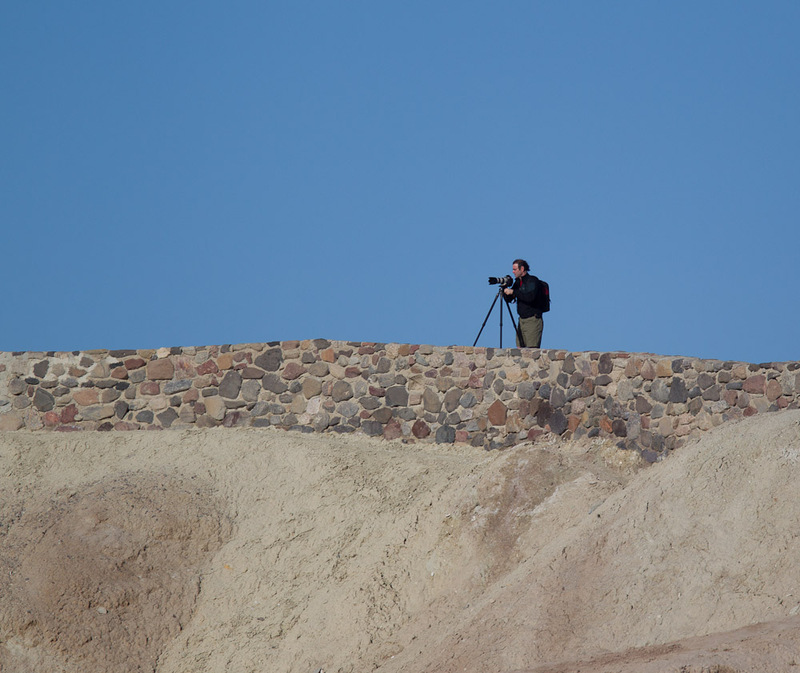 This is an image of me on Zabriskie Point, taken on Day 6, but the image I posted from Zabriskie point was taking the morning of Day 7. 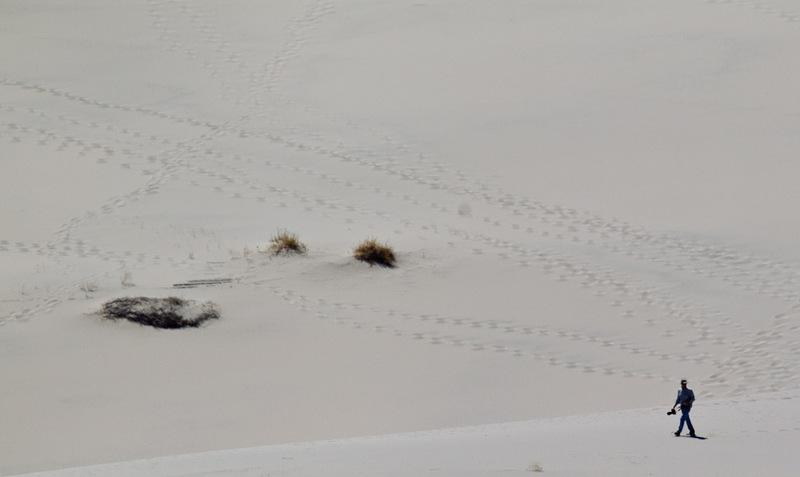 The photo below is the pair that goes with my photo of Rusty on Day 6 at Ibex dunes. Here I am at the salt flats at Bad Water on Day 6. Here is a wider shot with me as a black speck at Bad Water, also on Day 6. I had probably also walked farther out by this shot. 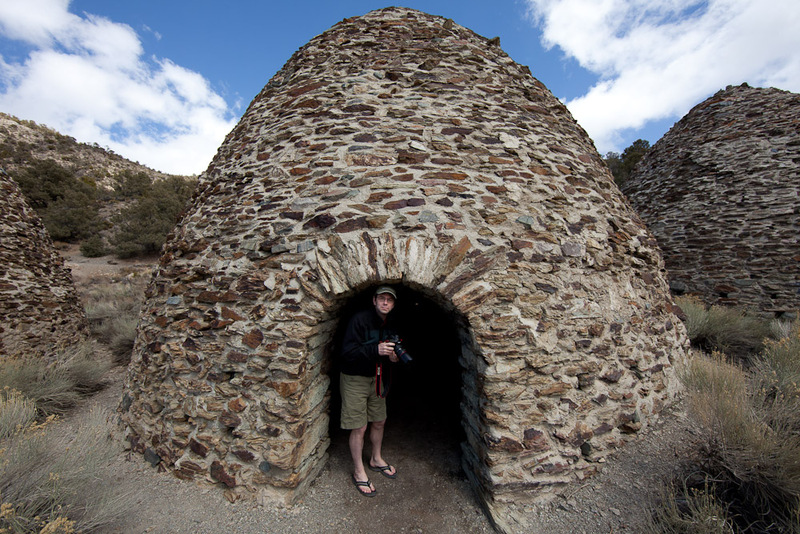 Investigating the inside of one of the Wildrose Charcoal Kilns, Day 7. 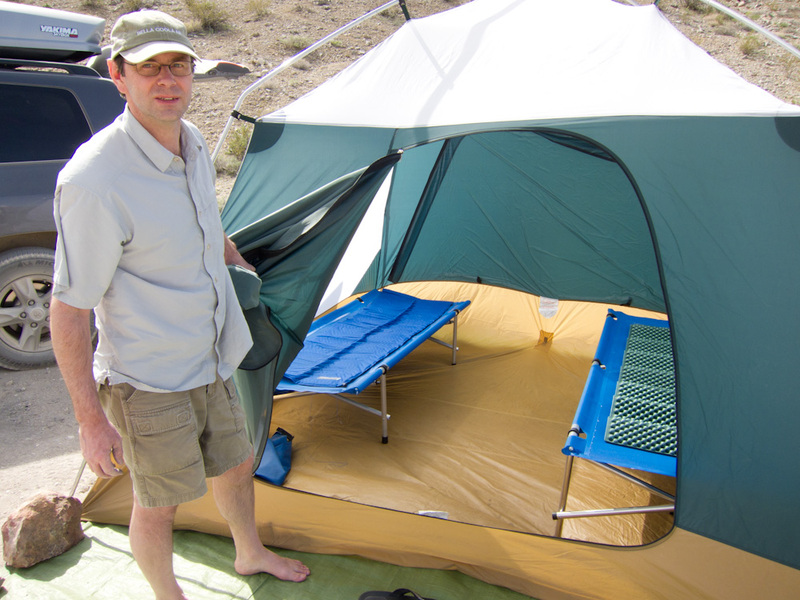 Final stages of setting up camp at Homestake Campground near the Racetrack Playa, Day 8. 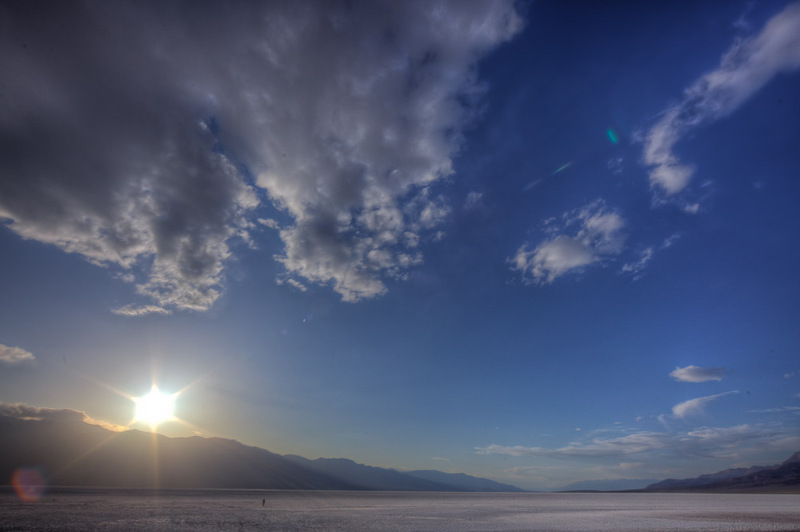 Here I am out on the playa, you may have to scroll over to see me, Day 8. 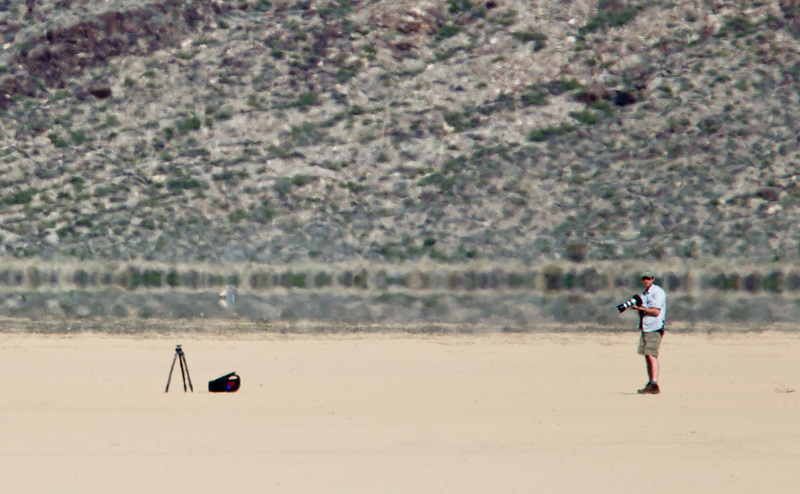 Taking a shot on the playa, notice the mirage effect. 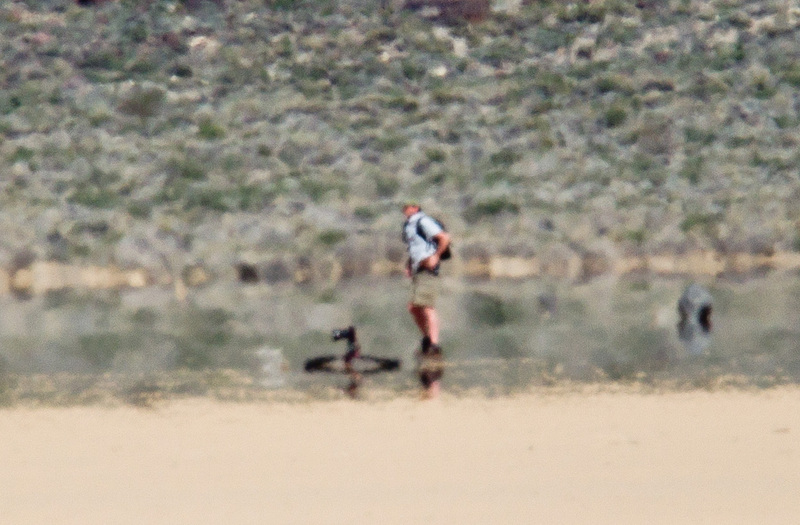 These shots are grainy and blurry because Rusty took them with a very long lens at over half a mile away. 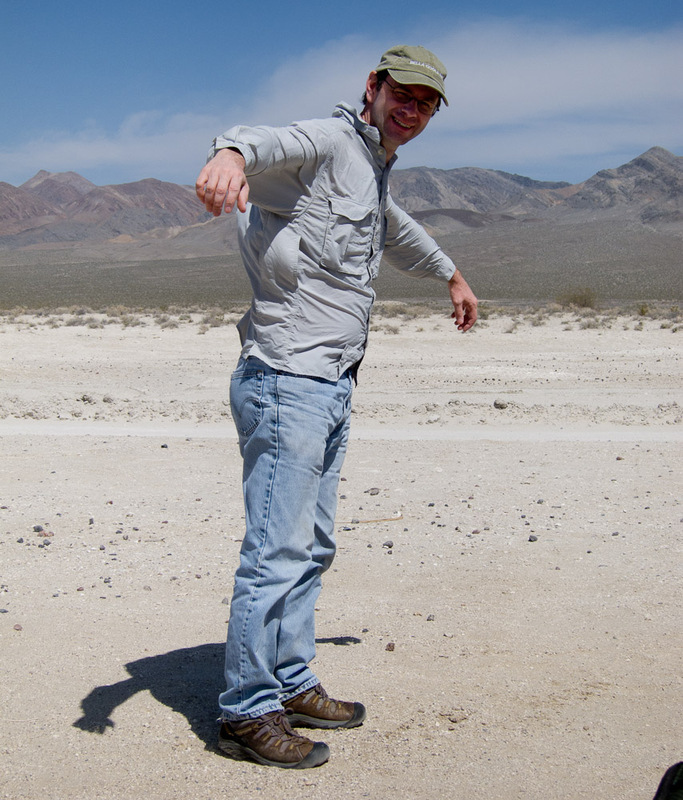 If you made it to this point, thanks for reading my entire journal entry for the 2010 Death Valley trip.